Berriewood understand how good ingredients can improve the health and happiness of your dog and have taken great effort to ensure everything that goes into Berriewood food is for your dogs benefit and nothing else. All Berriewood food includes Seaweed because it contains DHA (Docosahexenoic Acid) which supports a healthy brain, vision and nervous system. On top of that, the seaweed used is sustainable and renewable, making it an ‘eco friendly’ resource to boot. Ingredients: Chicken (60%), Brown Rice (5%), Vegetables: Peas (2%), Carrots (2%); Salmon Oil, Seaweed (55.5mg/kg), Mixed Herbs, Glucosamine (38mg/kg), Chondroitin (22mg/kg), Yucca Extract, Cranberry Extract, Yeast Extract – High Nucleotide, Minerals. Nutritional Additives per kg: Vitamins: Vitamin A 2,250 IU, Vitamin D3 328 IU, Vitamin E 26mg. Trace Elements: Zinc Sulphate Monohydrate 67mg, Iron Sulphate Monohydrate 42mg, Copper Sulphate Pentahydrate 9.6mg, Manganese Sulphate 6.3mg, Calcium Iodate Anhydrous 0.71mg, Sodium Selenite 0.09mg. Ingredients: Lamb (60%), Brown Rice (5%), Vegetables: Peas (2%), Carrots (2%); Salmon Oil, Seaweed (55.5mg/kg), Mixed Herbs, Glucosamine (38mg/kg), Chondroitin (22mg/kg), Yucca Extract, Cranberry Extract, Yeast Extract – High Nucleotide, Minerals. Nutritional Additives per kg: Vitamins:Vitamin A 2,250 IU, Vitamin D3 328 IU, Vitamin E 26mg, Trace Elements: Zinc Sulphate Monohydrate 67mg, Iron Sulphate Monohydrate 42mg, Copper Sulphate Pentahydrate 9.6mg, Manganese Sulphate 6.3mg, Calcium Iodate Anhydrous 0.71mg, Sodium Selenite 0.09mg. Ingredients: Ocean Fish (60%), Brown Rice (5%), Vegetables: Peas (2%), Carrots (2%); Seaweed (55.5mg/kg), Mixed Herbs, Glucosamine (38mg/kg), Chondroitin (22mg/kg), Yucca Extract, Cranberry Extract, Yeast Extract – High Nucleotide, Minerals. Ingredients: Turkey (60%), Brown Rice (5%), Vegetables: Peas (2%), Carrots (2%); Salmon Oil, Seaweed (55.5mg/kg), Mixed Herbs, Glucosamine (38mg/kg), Chondroitin (22mg/kg), Yucca Extract, Cranberry Extract, Yeast Extract – High Nucleotide, Minerals. Nutritional Additives: Vitamins: Vitamin A 2,250 IU, Vitamin D3 328 IU, Vitamin E 26mg. Trace Elements: Zinc Sulphate Monohydrate 67mg, Iron Sulphate Monohydrate 42mg, Copper Sulphate Pentahydrate 9.6mg, Manganese Sulphate 6.3mg, Calcium Iodate Anhydrous 0.71mg, Sodium Selenite 0.09mg. Your dog's needs may differ from the guide due to age, breed and activity level, always feed to maintain a lean active condition. Feed at room temperature. Once opened cover and store tray in fridge for up to 48 hours. If your dog hasn't eaten this product before, its best to introduce slowly over a couple of days. Remember your dog always needs a supply of fresh drinking water. 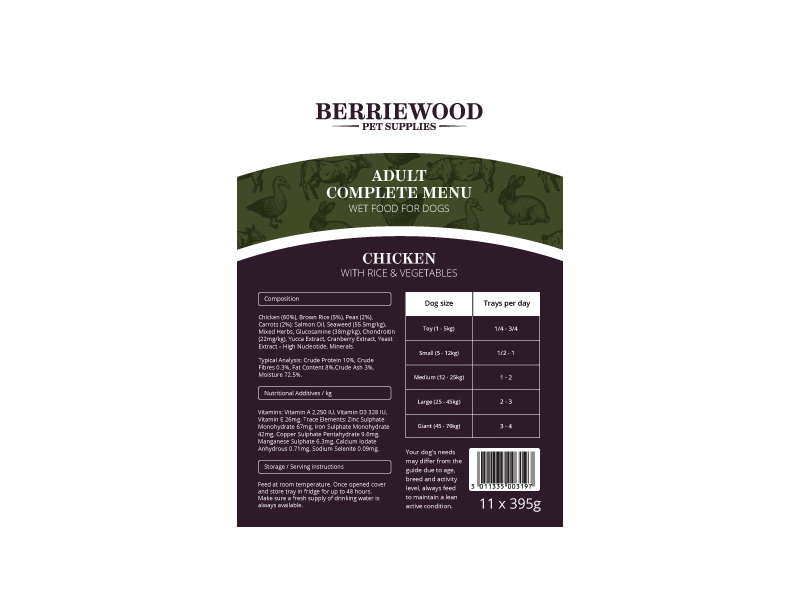 There are currently no questions for Berriewood Complete Menu Wet Food - be the first to ask one!